Paris — I find it very disquieting that so few among the West European and American commentators on the Ukraine crisis, private or public, seem concerned that the United States has started this affair, and that it is not inconceivable that it may end in a war. Even though the immediate mess was eventually sorted out, and Mr. Yatsenyuk (“Yats” to Secretary Nuland) was soon (briefly) the prime minister — and immediately was welcomed to Washington to dine at the White House with the American president — one must ask what was accomplished by all this that did not discredit the United States and the EU, and draw towards Ukraine and the American troops today deployed in Poland and the Baltics, and towards NATO itself, the storm-clouds of a useless war? It is the latest (and probably last) step in a foolish American and European betrayal of the promise given to Mikhail Gorbachev by President George H.W. Bush, at the time of the unification of Germany, that if the Soviet Union agreed to a newly united Germany’s assuming the Federal Republic’s existing place as a member of NATO, no NATO troops would be stationed in what formerly had been the Communist German Democratic Republic. The deal was done, and at the time was a cause for congratulations on all sides, since it removed the principal obstacle to Germany reunion, considered desirable (and inevitable) by the western countries, and as inevitable, given Germany’s history, by Moscow as well. This agreement was undermined during the Clinton presidency by measures that first gave the former Warsaw Pact countries of Eastern Europe what might be described as cadet NATO membership (the “Partnership for Peace”). Agreement to actual NATO admission came as part of the European Union Maastricht treaty in 1991, and in 1999 Poland, Hungary and Czechoslovakia (soon to become two states) became NATO members, and in 2004 the Baltic States, Romania and Bulgaria. Washington and the EU then turned their attention to the Caucasus and Ukraine. As early as 1987, the EU’s “Europe 2000” plan for expansion named Ukraine, Moldavia, and Belarus as eventual candidates for EU membership. Georgia was the first to be invited to prepare for NATO membership, and took this as a sign that NATO and the U.S. would underwrite its military recovery of its “lost lands,” and launched an attack on South Ossetia. Russia’s patience was exhausted. The Russian army promptly defeated the Georgians and took over the Ossetian statelet, and nearby Abkhazia as well. Washington and the NATO allies voiced loud outrage. But it was Georgia that had started this little war of national revenge. NATO was, and remains, an alliance effectively under complete American control. Its arrival on the frontier of the former Soviet Union was viewed by the new Russia of Vladimir Putin with disquiet. This was not supposed to have happened. It would take a closer knowledge than I possess of the workings of American government to explain why it decided to take control of post-1990 Central and Eastern Europe, following Communism’s collapse. For Poland, the former Czechoslovakia, the Baltic states, Hungary and Romania, who suffered badly under the Communists, NATO membership obviously offered reassurance. But for Georgia and other states in the Caucasus, and for Ukraine, NATO membership amounted to an annexation by NATO of nations formerly among the historical territories of Soviet or Czarist Russia. Why should the United States and the original states of the European Union — western, Roman Catholic or Protestant Christian, Atlantic-oriented states — decide to dismantle historical Russia by taking over nations once part of Russia itself (and in the Ukranian case had been the instrument of Russia’s conversion to Christianity), or had been colonies, some of them Muslim, of the Czars. That, in any case, is where we are now, and Russia’s reaction is not simply that of an aggressive and authoritarian President Putin — as the West likes to make out — but the hostility of a significant part of the Russian population, which only now has recovered its national self-confidence and ambition. What was the intent of all this? 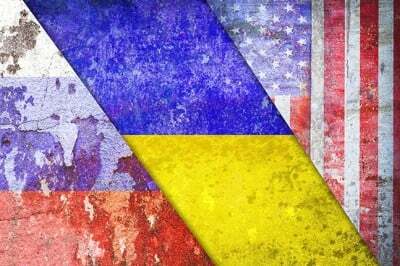 To create an east-west civil war in Ukraine? Why is that in the American interest? Russia’s intervention in such a futile war handed it back Crimea, but also apparent responsibility for some fool’s shooting down a passenger airliner. No U.S. troops on Russia’s borders. Protection and preservation of the Russian cultural identity of the south and east of Ukraine. Putin won’t yield. Any serious concession to the U.S. would cause him to fall from power, and produce disorder in Russia. For the future, he considers the U.S. in decline. He does not look to alliance with a rising China but to Germany, which he sees as the coming leader of a powerful Europe. What is Barack Obama’s interest in all this? What about the Washington hawks responsible for what is happening? Why have they done this without an explanation to the American people? There is only one possible solution now: negotiated truce on the Ukraine frontier, followed by Russo-American and EU agreement on the permanent existence of an independent and autonomous Ukraine. The alternative could be major war. Copyright Tribune Content Agency. All Rights Reserved.